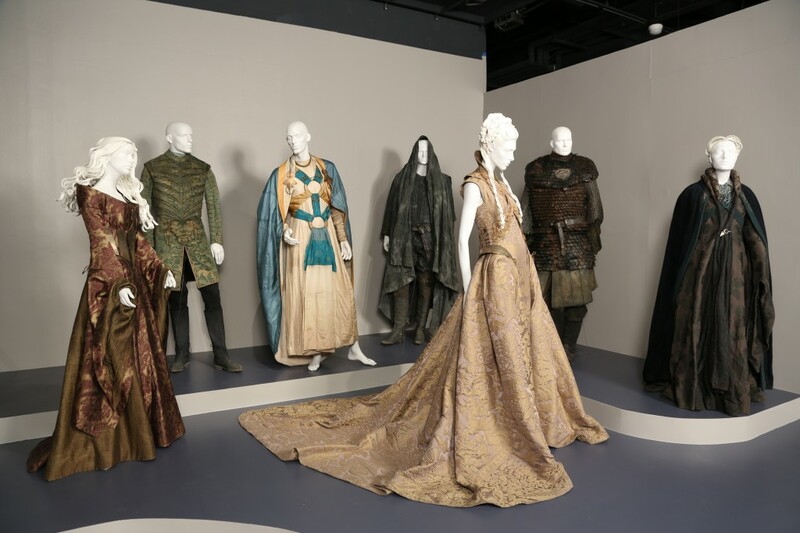 I recently got the chance to preview the 7th annual Outstanding Art of Television Costume Design exhibit at the FIDM Museum in Los Angeles. The exhibit runs through October, and is absolutely fantastic. The curator of the exhibit was Mary Rose, president of the Costume Designers Guild, and a costume designer herself. She put together the showcase based on some of the most talked about television shows and movies this past season, some of which received nominations for this year’s awards. 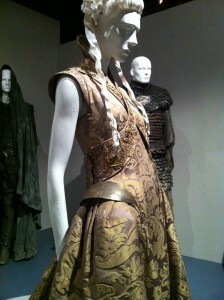 The show is a great blend of fantasy and period pieces, as well as some modern offerings, which don’t always get the same attention, but still require great skill on the part of the designers. I attended as part of a special preview for bloggers, and I’d like to extend a special thanks to my tour guide, FIDM spokesman (as well as designer & Project Runway alum) Nick Verreos. Nick was kind enough to give me a tour of the exhibit, and offered some great scoop and insight into the designers’ processes. There was so much beauty on display, I hardly know where to start! Costumes for television are particularly unique. The designers create for characters who have the chance to develop over time, yet must hook us right away in order to pull us into the story and keep us there. Nick and I talked about how much feeling and information a piece of clothing must convey immediately on our screens. The costumes are so essential to an actor’s performance as well. In my own work I’ve had so many actors tell me how much they love getting into their costumes because it helps them really become their characters. I also think television is almost more intimate than film, since we invite these stories directly into our homes on a regular basis. We get to know the characters and the stories they’re telling on a deep level, and that makes some of the costumes even more memorable. Despite that intimacy, many of the details can still be lost, even with HD, so it was exciting to get a closer look at all the careful attention put in to these works of art. 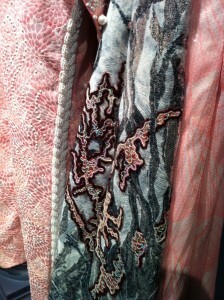 I recently read a piece about all of the unique embroidery done on the costumes for HBO’s Game of Thrones (last year’s Emmy winner and a nominee again this year), and I loved being able to see that up close and personal. Nick told me that the costume designer for GoT, Michele Clapton, tries to keep the time period vague, since it’s a fantasy world. There are elements of Shakespeare and Robin Hood, and even ancient Egypt. I saw a beautiful gown worn by the character Sansa that had a Shakespearean influence with some unique twists. It had the full skirt and silhouette of a Renaissance gown, but unlike many dresses from that era, it was sleeveless. It also had small touches of armor-like metal at the hips of the skirt, giving it an appropriate feel for difficult, war-prone times. Clapton really did an excellent job of giving each character his or her own look, yet still keeping all the pieces unified. And here’s a fun piece of costume trivia – for one character who is continually at war, the costume department did not wash his robe for extended periods of time to make it more realistic given the difficulties of battle. It started to smell quite horrible, but the actor felt as if it helped him really embrace his character’s struggles. 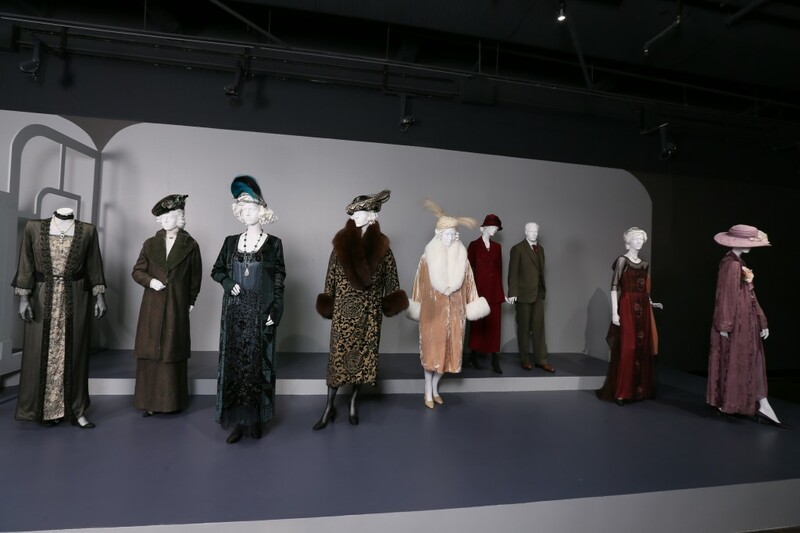 You’ve heard me talk about my deep and profound love for the costumes of Downton Abbey, so needless to say, I was extremely excited to see the large display of nominated costumes from the show. They did not disappoint, either! 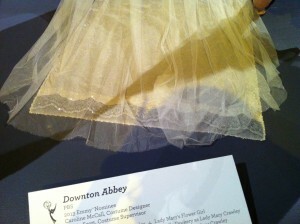 Caroline McCall, Downton‘s designer, put an impressive amount of detail into her creations. The beauty of these pieces is astonishing. 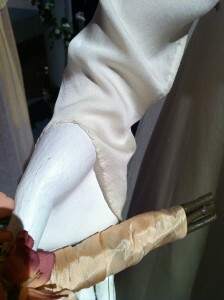 So many details that can’t be seen from our couches went into the costumes. It was great to see the different styles too, from the more conservative (and somewhat stuck in the past) Dowager Countess Violet (played by Maggie Smith) to her contemporary, Shirley MacLaine’s Martha Levinson, who is far more stylish and modern. Nick and I had a great conversation about how her character probably reads Vogue and can get away with taking more fashion risks because she is an American, and would have been more apt to embrace the changing times than her British counterpart. And then there were the wedding dresses! Lady Mary’s and Lady Edith’s dresses from this past season were on display, and as beautiful as they were on screen, they were even more stunning up close. Both had the style and silhouette of the 1920s, and each was different and special in its own way. Nick told me that McCall took inspiration from Lanvin catalogues of the time period, as most women at the time (especially those with higher social standing) custom-ordered their clothing. It’s almost impossible to find actual 1920s fabric still in good enough condition to use, but she was able to at least make the shape and cut of the dresses true to the period. Edith’s dress was gathered at the side waist with some beautiful appliqués and embroidery that were also featured on the skirt and train of the dress. And McCall also put in detailing that we at home would not have been able to see, but makes the dress even more special – the sleeves had a hand-rolled hem, done with silver metallic thread that caught the light in just the right way. 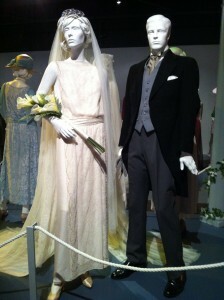 Lady Mary’s dress was exquisite as well. 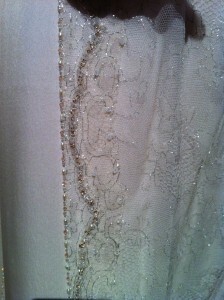 It had a squared-off train and panels of delicate lace with hand-beaded trim that any bride, past or present, would love to wear. McCall again used metallic thread in this dress, this time in gold. 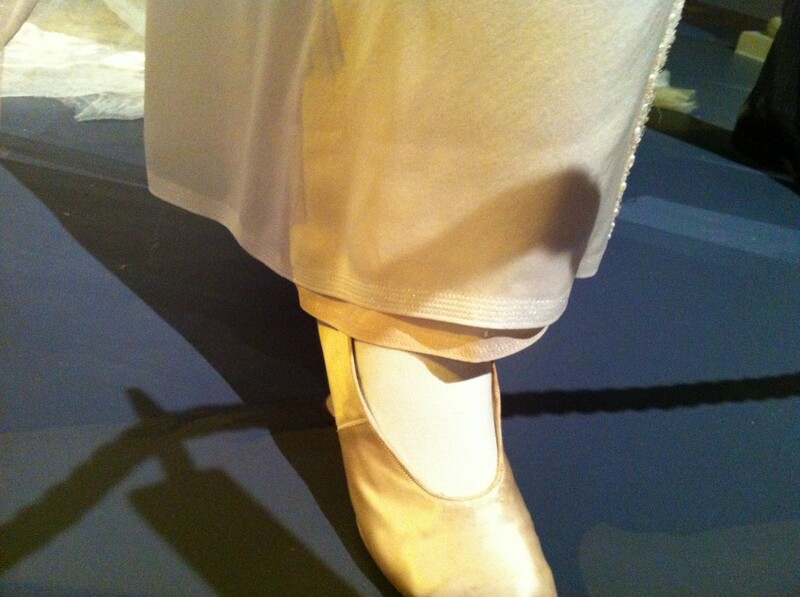 The hem involved several parallel rows of impeccable gold stitching. 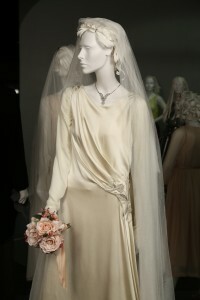 The fine, lightweight tulle of Mary’s veil was tea-dyed to give it a creamy, vintage look. And from all that subtle, delicate beauty I now turn to the wild, extravagant excess that was Behind the Candelabra. 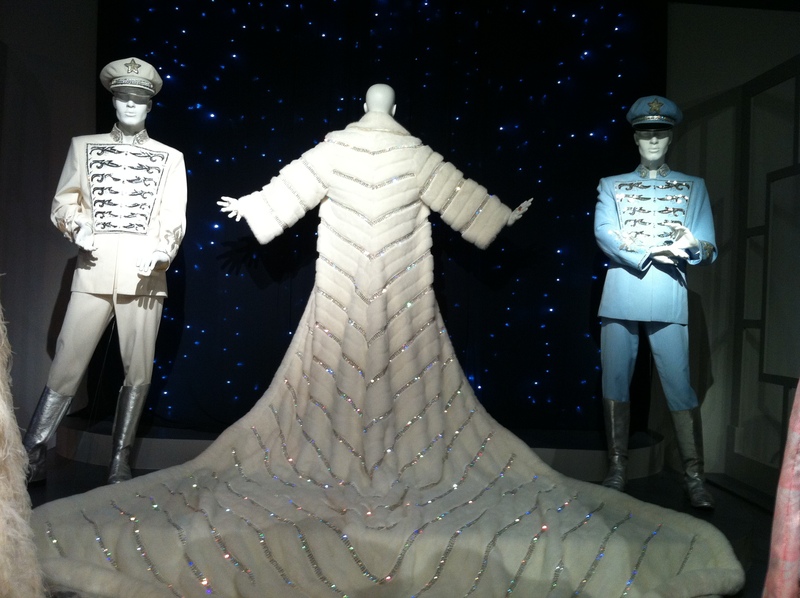 The costumes from the HBO movie were a marvel. Nick told me that Emmy nominee Ellen Mirojnick only had five weeks (!) 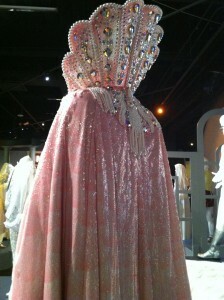 to re-create Liberace’s signature looks. The costumes would have been stunning no matter how long they took to construct, but the fact that the film’s costume department was able to accomplish all that detail in such a short amount of time makes them even more impressive. (Needless to say, I’ll be surprised if they don’t take home the award in September!) 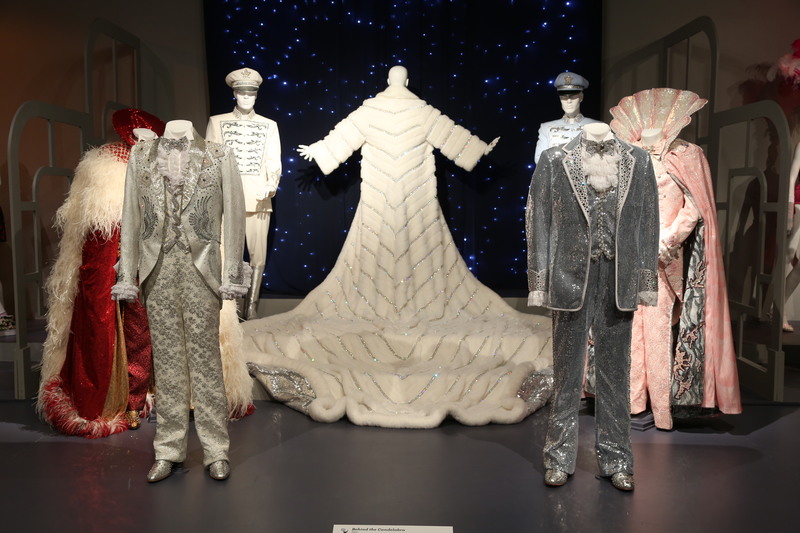 Mirojnick also had less creative license with Liberace’s costumes because there are so many iconic photographs of him, and she had to recreate the looks in a less expensive, but still visually stunning, way. The detail “behind the candelabra” was incredible. Other 20th-century period pieces were on display as well. Ring of Fire, the recent June Carter Cash biopic (Lifetime) designed by Rhona Meyers, featured many real vintage pieces that were specially tailored and adjusted to fit Jewel and the other actors wearing them. 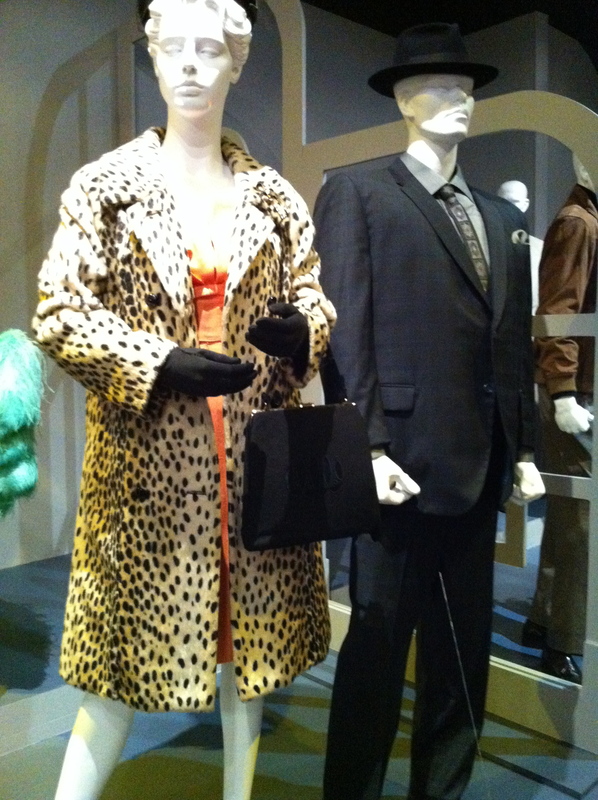 Kathleen Detoro, the costume designer from CBS’s Vegas, used a mix of custom-made pieces and items from costume houses. The men’s suits in particular often came from wardrobe houses. Some of the coats and fur pieces for the women had to be recreated, though, as pieces like that have become worn with time and would look too shabby for the characters. 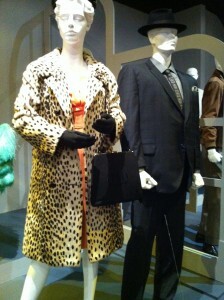 The same is true for the fur pieces from Smash on NBC (designed by Joseph G. Aulisi). 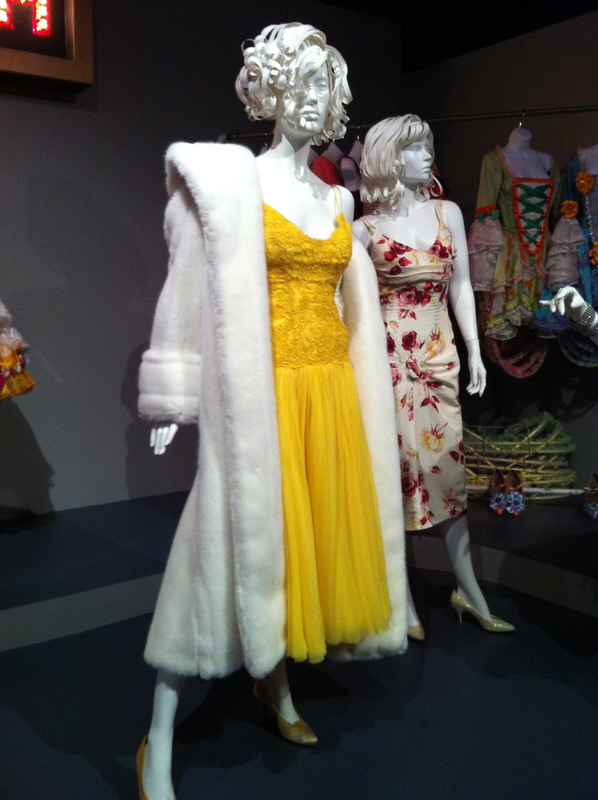 On display was a fur coat worn by Katharine McPhee’s character that needed to be white. Since most vintage white pieces have yellowed over time, Aulisi created a new, vintage-inspired faux-fur coat that made a more Smash-ing impression. 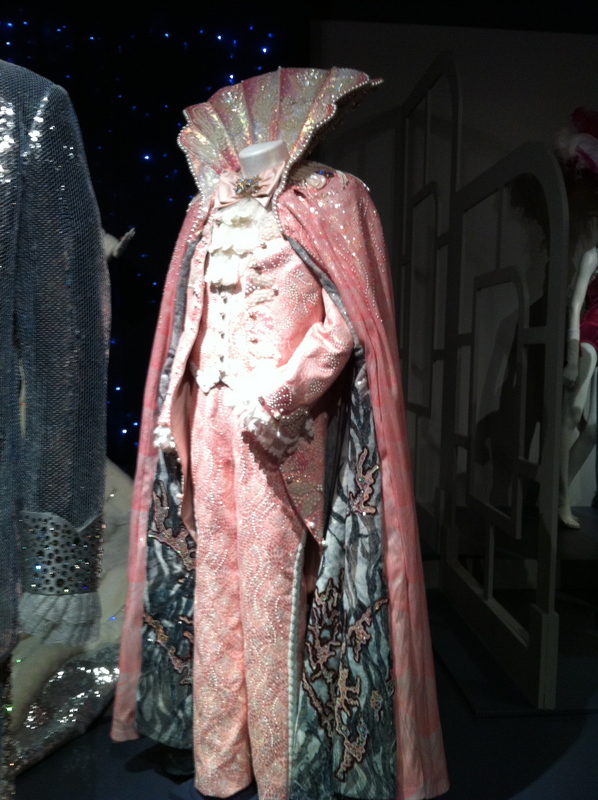 The exhibit provides a great balance between the elaborate period and fantasy looks and modern-day costumes, which require just as much thought and consideration but don’t often get the credit they deserve. Even though the designers are doing more shopping than creating from scratch, they still have to carefully think about what items they choose in order to convey the right messages about the characters. In Netflix’s House of Cards, Robin Wright’s character is a modern-day Lady Macbeth, and her costumes reflect that with crisp, harsh lines and bold yet dark looks. They convey immediately that she is a powerful force to be reckoned with. The black cocktail dress she wears when we meet her in the first episode is a designer piece that was altered to better fit her character. But costume designer Tom Broecker doesn’t just give his female characters a lot of time and attention – Kevin Spacey’s Frank Underwood wears suits from Savile Row, and the designer spent eight hours on fittings for the actor’s dress shirt alone, so that it was exactly the perfect fit for his body, as well as his careful, deliberate Congressman. 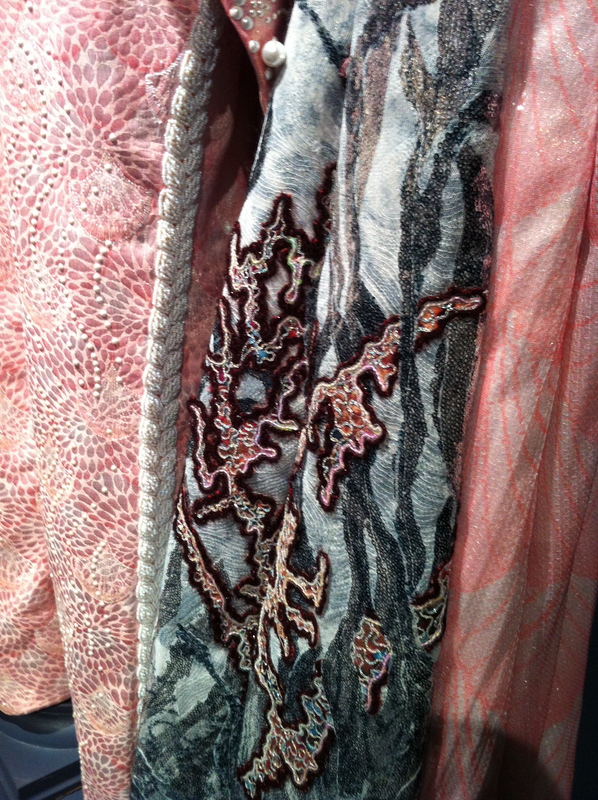 Scandal, set in a similar political world, also relies heavily on designer pieces. 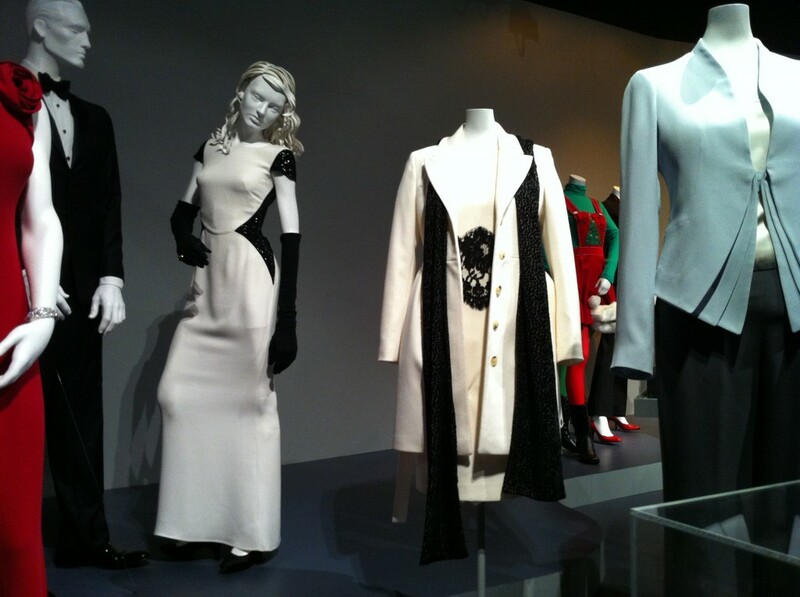 On display were some of Kerry Washington’s signature looks from the show, ranging from elegant evening gowns to stylish power suits, and one of my favorite ensembles, a white sheath with black lace accents and a gorgeous matching coat. Lyn Paolo puts Washington’s Olivia Pope in everything from Stella McCartney to Tom Ford. While most women in Olivia’s profession probably wouldn’t be able to afford quite that many expensive pieces, Paolo tries to keep her grounded in reality by reusing and mixing-and-matching some of her separates, as well as having her carry the same few handbags. 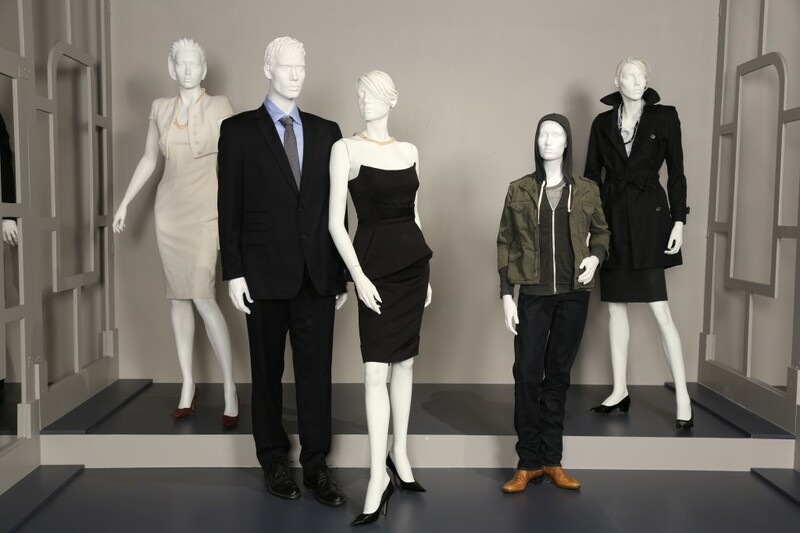 In addition to all of these gems, FIDM’s exhibit showcases the fantastic costumes from 2 Broke Girls (by FIDM alum Trayce Gigi Field), The Americans (Abigail Murray & Jenny Gering), Girls (Jennifer Rogien), Mr. Selfridge (James Keast), Nashville (Susie DeSanto), Parks & Recreation (Kirston Leigh Mann), and Rectify (Ane Crabtree). 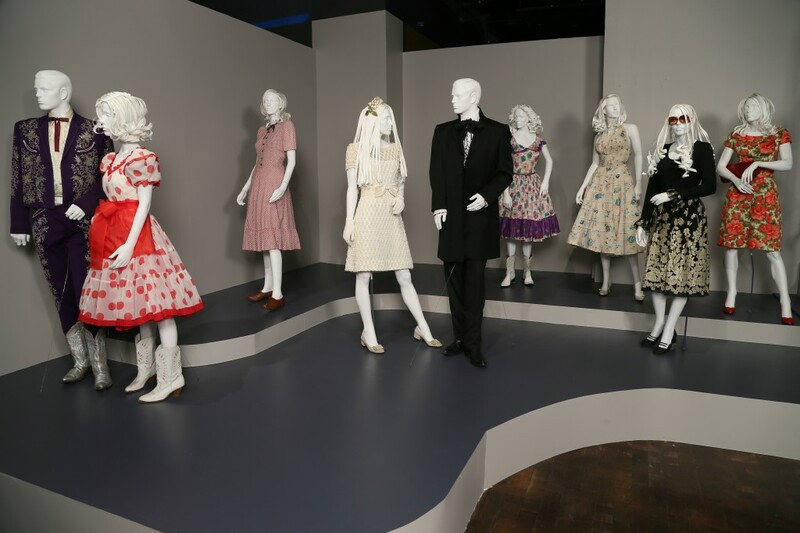 The collection is such a wonderful showcase for the talented costume designers working in television, who do not get nearly the attention they deserve. So much time and effort goes into both the period and the modern pieces, and it’s exciting to see the results of that effort in person. FIDM and the Academy do these designers a great honor and service. The show runs through October 19 at FIDM’s Downtown LA facility (and it’s free! ), so don’t miss it. For more details & directions, please visit the FIDM Museum’s website.